Rowan University [formerly UMDNJ], 2011. Dr. Swanson’s clinical interests are in the Neurological Rehabilitation of patients with Acquired Brain Injury. 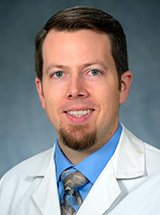 His goal is to assist patients in achieving optimal return of neurological function following all forms of Brain Injury (including Traumatic Brain Injury (TBI), Anoxic Brain Injury, Cerebral Vascular Accidents (Stroke), Brain Tumors, Movement Disorders and Neurodegenerative Disorders) through a combination of clinical practice and scientific research. Knoll RM, Reinshagen KL, Barber SR, Ghanad I, Swanson R, Smith DH, Abdullah KG, Jung DH, Remenschneider AK, Kozin ED: High Resolution Computed Tomography Atlas of the Porcine Temporal Bone and Skull Base: Anatomical Correlates for Traumatic Brain Injury Research. J Neurotrauma. 36(7): 1029-1039, Apr 2019. Hampton S, Swanson RL 2nd, Smith DH. : Neurological Symptoms in US Government Personnel in Cuba-Reply. JAMA 320(6): 604-605, Aug 2018. Swanson R, Hampton S, Green-McKenzie J, Diaz-Arrastia R, Grady S, Verma R, Biester R, Duda D, Wolf R, Smith D: Neurological Manifestations Among US Government Personnel Reporting Directional Audible and Sensory Phenomena in Havana, Cuba. JAMA. JAMA, Epub ahead of print, February 2018. Swanson R: Biotensegrity: A Unifying Theory of Biological Architecture with Applications to Osteopathic Practice, Education and Research — A Review and Analysis. J Am Osteopath Assoc 113(1): 34-52, 2013. Gilliss A, Swanson R, Janora D, Venkataraman V: Sacroiliac Somatic Dysfunction Causing a Compensated Trendelenburg Gait: A Case Presentation. J Am Osteopath Assoc 110(2): 81-6, February 2010. Newberg A, Wang J, Rao H, Swanson R, Wintering N, Karp JS, Alavi A, Greenberg J, Detre J: Concurrent CBF and CMRGlc changes during human brain activation by combined fMRI-PET scanning. Neuroimage 28(2): 500-6, November 2005. Newberg A, Amsterdam J, Wintering N, Ploessl K, Swanson R, Shults J, Alavi A: 123I-ADAM Binding to Serotonin Transporters in Patients with Major Depression and Healthy Controls: A Preliminary Study. J Nucl Med 46(6): 973-7, June 2005. Swanson R, Newberg A, Acton P, Siderowf A, Wintering N, Alavi A, Mozley P, Plossl K, Udeshi M, Hurtig H: Differences in [(99m)Tc]TRODAT-1 SPECT binding to dopamine transporters in patients with multiple system atrophy and Parkinson's disease. Eur J Nucl Med Mol Imaging 32(3): 302-7, March 2005.